Jack Spence (1926-1978) was ‘Mr. 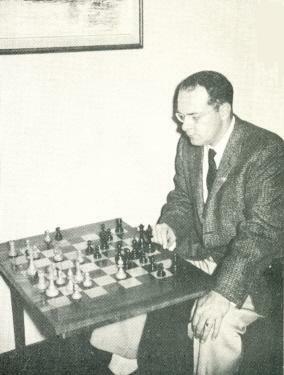 Omaha Chess.’ Spence was an expert-level player, winning the Nebraska Championship in 1951, and coming second in 1955, 1958 and 1969. He won numerous other local events, including the 1950 Omaha Experts and the 1955 Swenson Championship. Spence furthermore served as one of the most active organizers in the Midwest in those years. Spence was known far beyond the Nebraska state lines, however, and this because of his ‘Spence Limited Editions.’ In those pamphlets Spence undertook the arduous task of collecting and printing game collections from dozens of tournaments around the globe. He edited and published two chess magazines – the Midwest Chess News / Nebraska Chess Bulletin (47-59) and the Ohman Memorial Club Newsletter (69-78) – that would still rival the best state chess publications available today. Many games and crosstables that would otherwise be lost to history are only known because of Spence’s efforts. Finally, as if this weren’t enough, Spence published early game collections of leading attacking players such as Teichmann and Spielmann. Jack Spence graduated from Central High School and Creighton University. He was, for many years, a lawyer in Omaha. We will add more information to this page as we discover it. For the time being, John Tomas has kindly allowed us to offer his 2001 article on Spence from the Gambit for download. Thank you, John! Jack Spence, taken from the jacket from Spence and Liepnieks’ 1958 book on Smyslov. Image hosted by Edward Winter at Chess Notes. Glad we could be of help! Let me know if you are interested in selling them or donating them to the club! I may be interested in doing something with the Spence Limited Editions, along with my late (1932 – 2012) father’s whole chess library. He was a life-long chess enthusiast. It is hard to part with many things, but at the same time, if they could be appreciated or used as they were by my father, that is also meaningful. Currently they are only collecting dust at my mother’s house. I have just started researching the things that he had. I am an amateur dealer in ‘vintage items’, but I know very little about the appeal or interest in these types of items. My father organized and ran a community chess club at the college where he was a math professor for many years. I think a chess-club, particularly the club that is the name-sake of the author of the Limited Editions, could be a fitting home for them. Does the club currently have any of Jack Spence’s books or transcripts? Would your interest also extend to the vintage magazines or books that I have? I have read that they are interesting for collectors but could be “dated” as far as the game strategies go. Again, my knowledge is limited on this. Thank you for your help and interest! Rachel – send me your e-mail address via the ‘contact us’ form and we can discuss privately.